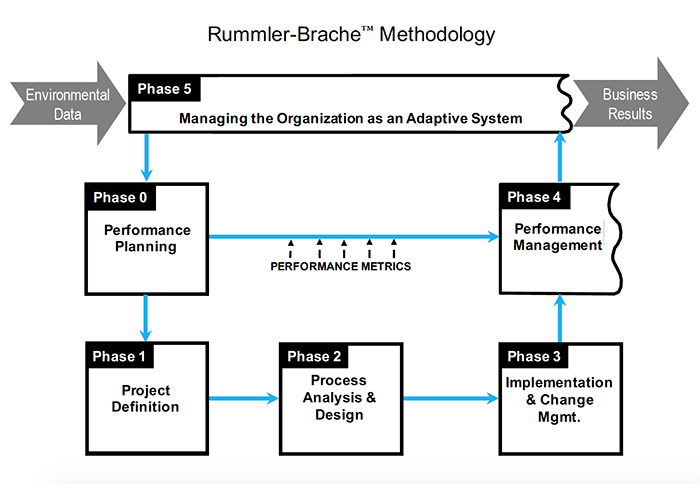 The input to Phase 5 is either a performance improvement plan or an optimized process. Without an effort to tie processes together, process tunnels can quickly replace function silos. Integrate all three levels of performance— the impact of an individual's actions on process and organizational performance is well understood in Phase 5. The metrics at all three levels now connect to one another. Leading and lagging indicators. Leading indicators (process measures) provide a basis for diagnosis/analysis of performance so that adjustments can be made in time to prevent the lagging indicators (organization measures) from deteriorating. External variables—metrics related to external factors (i.e. market shifts, new regulations, new competitors) that influence organization performance. Plan and manage processes and organizations as systems. This planning is derived from the organization’s strategy. In Phase 5, decisions are made and action is taken more readily and more frequently than in past because the quality of the information on which the decisions/actions are based has improved substantially.